For a defeated primary challenger to be more visible than the incumbent himself is rare. But, in her telling, that’s exactly the exasperating situation in which Debbie Halvorson, the former congresswoman who tried in the primaries to unseat Rep. Jesse Jackson Jr., finds herself. “This is how Jackson has been since he got elected in ’95,” says Halvorson. “When he felt like not being around, he wasn’t. He did his own thing. I’m everywhere, even though I’m not in politics anymore. He’s nowhere.” No kidding: Jackson has not been spotted in Chicago in months. Which is not to say Jackson hasn’t been in the news. His abrupt departure from public life in June, the subsequent announcement that he suffers from bipolar disorder, and the FBI probe into misuse of his campaign funds have all been gleefully chronicled by Gawker. His apparent illness mined has been mined by the Mail Online for yuks. Jackson has been spotted twice in the flesh–but both of those sightings have been 1,000 miles from Chicago: Anonymous tipsters saw him in a D.C. bar and The Daily found him smoking expensive cigars on the stoop of his pricey Washington house. He has only just addressed his constituents in a robocall. The recorded greeting, alas, gave no specifics on when he would return to the business of serving his district. 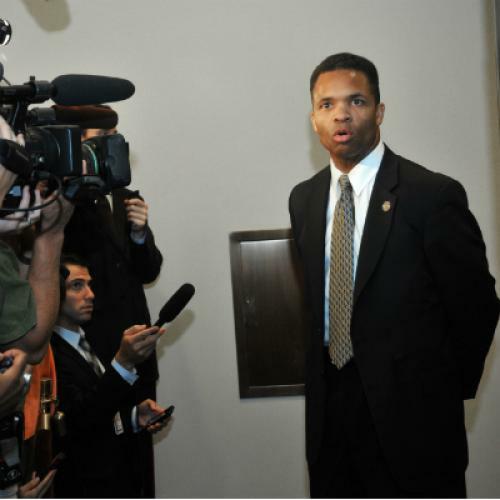 All the same, Jackson is poised to win handily over three challengers who've been exhaustively traversing his congressional district in the flesh—a fact that makes his race less zany than surreal. And when he talks to the voters abandoned by Jackson? “There’s an indoctrination in Cook County that Democrat equals good and Republican equals bad. So I first have to hear them out on that … even though I’m actually here, and ready to be a voice for them.” Indeed, just this Monday, a We Ask America poll showed Woodworth running 30 points behind Jackson, and not terribly far ahead of Independent candidate Marcus Lewis. Lewis, too, begs of voters, “Don’t vote for a ghost. Do not vote for someone that is not showing up for you anymore. It’s like Elvis has left the building.” The efforts haven’t done much for Lewis’ ratings: We Ask America failed to even spell his name correctly. Then there is the confounding apparatus that is Jackson’s candidate-less campaign. Its coffers dwindle without his fundraising. It produces neither mailers nor television ads. Its website reminds voters of the early voting state date for the primaries: February 27. The staff has no events to tout or coordinate, no candidate to orbit as he preps for town halls or radio interviews. It spends money—not least of all on consulting fees for Jackson’s wife—but doesn’t do much else. The many articles on this bizarre political contraption end with a winking, “Jackson’s campaign did not respond to requests for comment.” (And by the way, they didn’t). Those for whom Jackson’s absence is not so farcical are his deserted constituents. Take Jerry Brown, a 58-year-old retired AT&T technician. Brown lives in Chicago’s West Pullman neighborhood, one of the areas most affected by the city’s unbridled violence. In April, Brown was robbed and beaten with a pistol by five boys—they were all under the age of 18—in front of his home. For him, the attack was a perfect focal point for everything wrong with his congressman. Once, Jackson could be counted on to bring home the bacon to his district; lately, Jackson had brought home hardly any money to finance the local hospitals that treats victims of violence like Brown. The staff member Jackson had dispatched to Brown’s chapter of the Parent Leadership in Action Network—a state program to help parents disrupt youth violence—was disinterested, non-committal, and unresponsive. Jackson wasn’t even making use of his bully pulpit anymore to address intensifying crime. “I’m not the sharpest pencil in the box, but I take good notes with the pencils that I have,” Brown told me. “You can look around and see that things aren’t getting done.” His meaning is clear: he wonders if Jackson were ever really there, at all.